HAPPY THANKSGIVING and CHRISTMAS GIVEAWAY! Greetings Friends and Happy Thanksgiving. I hope you have a blessed day filled with good times shared with family and friends. As the dinner is prepared, the parades enjoyed by many and the Christmas shopping begins, I want to send to you my thanks for a year filled with friendship and joys in blogland. Just leave a comment on this post to enter and another entry if you choose to follow. That's it! I look forward to giving away a special gift with my best wishes for a beautiful Christmas and New Year filled with all God's blessings. I would love to send someone this pretty vintage keepsake box. These vintage boxes were once given to high school girls as a gift at graduation. For this one I have hand painted it a light soft pink and accented the outside bottom with soft white stripes, and roses with side rose buds. The top graces a vintage graphic that reads, "There's Gladness in Remembrance" perfect for holding dear letters, postcards, or small keepsakes. Glittered for sparkle and finished inside with corner roses, lid rose and little pearly drop with ribbon at the original locking fixture. Trimmed in pink millinery and ready for a giveaway winner. Thank you for your blogging friendship, visits, comments and shopping in my boutique. You mean more then you know. Christmas came early for me last weekend as I had the wonderful opportunity to meet a dear friend and blogger, Ginny, from "Faith Hope and Tea Therapy. "She is a beautiful, charming, and delightful christian lady inside and out. Our meeting was like we have been friends our whole life and visiting over lunch made us realize how our lives had mirrored each others, both being originally from Michigan. Ginny's purpose traveling to Texas, was to be with her dear friend Sue to celebrate the anniversary of Sue's brother Mike's 10 years of priesthood, in the Catholic Faith. It was an amazing day as my best guy and I, being near by, went to meet Ginny for lunch and on to church and the celebration for Father Mike after wards. The Mass was Spirit filled and the love shown to this wonderful priest was heart warming and inspiring. Sue and Mike's brother Don also traveled from California to attend the celebration. Here is a picture of the wonderful family with Ginny kneeling on the left. I am sorry to say, I did not get a pic of Father Mike, but I am sure that Ginny will have one and share on her blog later. Our lunch was delicious and we all tried, for the most part, to eat a healthy meal consisting of chicken, fish, veggies and rice. Followed by~~~~ this!!!!!!!!!!!!! You know, Everything is BIG IN TEXAS!! So yummy and enough for all three of us with lots left over. We exchanged gifts and Ginny gave me a bit of my old home state with the gift of Sander's Chocolate Sauce. This is a rare treat as Sander's, an old vintage soda fountain and bakery, is no longer in business in Michigan although the products are now being sold in grocery stores. I used to go to Sander's as a child and carry many happy memories of good times spent in that heavenly place!! Hubby is delighted and can't wait to have his ice cream and chocolate sauce. Sander's was known and famous for a creme puff filled with vanilla ice cream and this chocolate sauce poured over top. WOW, I can feel myself gaining 5 pounds just thinking of it!! Next Ginny presented me with this box and I was just overwhelmed at the site of it, knowing another treat was upon me. Bronner's is a wonderland of Christmas delight shared in darling shoppes that line vintage style streets. I have not been there in years. What could be inside this box. Oh my goodness, a snow angel kneeling with her sweet little deer friend and bundled up for the winter cold and Christmas day with wings of glass and snow laced. It is gorgeous and I simply love it. She will share space among my angel collectibles forever. And if that was not enough, Ginny gave to me a beautiful hematite bead rosary. It is simply gorgeous and means so very much to me as I collect these spiritual wonders. Later after church, Father Mike said a blessing over my new rosary. It was very special and a time I will hold dear always! Our time together with Ginny flew by all to quick. By the time you read this post, she will be gone from Texas and back home in Michigan with her dear hubby and family. I miss her already and look forward to another visit in the future. Till then, I will hold close our kindred spirits, love of our Saviour and memories made while praying together in church. There is something so special when you worship with a girlfriend. I know our meeting was blessed from above and nothing happens without purpose. Take a moment and visit Ginny at her lovely blog. She is a marvelous writer and you will receive a blessing in her spirit filled posts that take everyday life and incorporate God's teachings in our world today. Yes, Christmas came early in meeting and visiting with Ginny and I thank God for the Gift of Friendship! I hope you have an amazing week as we approach Thanksgiving and your day filled with all God's blessings with family and friends. I will be taking a little time off this week, but back in my next post to share my Christmas giveaway just for you in Thanksgiving to all my blog friends. See you soon and Blessings always. Happy Friday and welcome to shopping with a twist, our themed Friday event from Make Mine Pink. Today we share and offer treasures that touch our hearts with "Simple Delights" The cherished items that bring back memories, or the new pretties that make new ones. Please join us as we shop the many fabulous shoppes offering treasures with our shopping with a twist today. I have picked a few items from my shoppe to fit the theme and you can visit HERE to see those "Simple Delights"
For me, Simple Delights are the dear and special treasures I have collected over the years that give my family and myself so much joy. From a comfy crocheted throw to knitted slippers made by my grandmother, these are truly simple delights. This time of year, as we approach this special holiday season, I remember all the wonderful Christmas dinners enjoyed on my mother's and grandmother's blue willow dinner plates. I can still remember helping my mother to set the table with these beautiful blue and white plates. The dinner always tasted better at mom's and even more so on these plates. It was a special occasion when mom pulled out those plates from her china cabinet. Today, I use these very same dishes everyday in my kitchen. Everyday is special when we have dinner using these plates. We remember and feel close to times gone by. Times we can only remember now in our memories, but occasions that surely bring us to appreciate a simple delight. As I walk through my home, I am always thankful for the blessings in small and simple treasures. It may be a little pillow, a candle holder, sweet tea cup or a treasured book. All items that have a connection to who I am and where I have come. I hold dear all those wonderful simple delights that can never be replaced. To view them every day, is a gift! Recently I found a vintage sock darner and it made me smile as I remembered my mother and grandmother using one to darn socks. It was a time when we did not throw away or toss aside, but rather mend and fix and give new life. A pair of socks had a few more good miles once mended. While we may not mend socks today in the same way, when I found the darner it had to come back with me to the studio for a redesign. It was then, as I observed the tool up close, I was inspired and my thoughts went to thinking of the little verse, "Hands to work, Hearts to God" Thus created this little Christmas ornament or one to share with a sewer or vintage sewing tool collector. I added a couple little charms to accent the meaning. Another simple delight for me is my joy to own my great grandfather's shoe molds. He was a shoe designer in Italy when he came to America with his wife and six children, continuing his creative muse designing shoes to feed his large family. This may just be the reason I love shoes so much. LOL!! It's got to be in the genes! Anyway, I love to redesign and paint shoe molds, although I keep his original and on display a top a large shelf gallery in our staircase. They give me great joy to know how hard he worked and how those molds made shoes for many through the years and helped to raise six wonderful children. As I continue to find vintage molds here and there in my treasure hunts, this one caught my eye a month or so ago and it quickly became a shabby rose delight. Whatever you love and call your Simple Delights, I hope you are blessed to enjoy each and every treasure that give your heart happiness and great joy. It really is a special blessing from above. 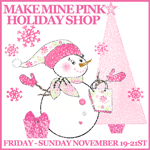 As we begin the holiday season with Thanksgiving so near, I'd like to also invite you to visit Make Mine Pink for a Holiday Shop Hop starting today Nov. 19th through Sunday the 21st. One spot to shop for treasures from many wonderful on line sellers. I will have a few items included and also these new winter snow trees sold separately with hanging word ornaments and stars removable for you to design a look however you choose. They are carved wood, hand painted fresh crisp white and glittered throughout with fur trim for snow at the base. A simple delight that is simply divine for the shabby and chic cottage home. They are a nice size too, measuring 18 tall for the large and 14" tall for the medium size. Thank you for taking the time to visit and share in a few Simple Delights. I also want to thank you so much for the well wishes and encouraging words some have shared in emails to me after viewing my little ads in some of my favorite magazines this season with opportunities with MMP. My newest is Romantic Homes. I was just overwhelmed when they contacted me, last July to offer a place in the little pink pages starting with the November 2010 issue. Hey, at first I thought it was a spam, but I quickly learned it was for real and the wonderful people at RH's a true delight to work with. God is truly opening new doors all the time and I am so blessed to be on this journey working in what I was born to do. Yes, another simple delight!! Blessings for a special weekend.